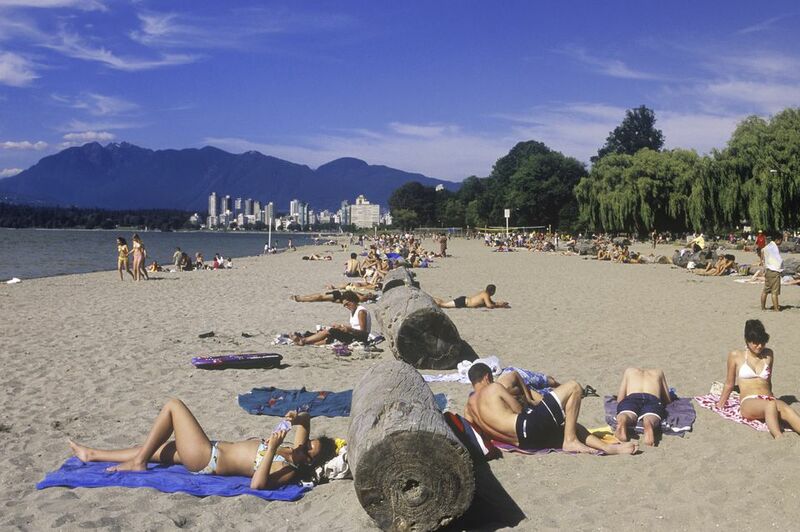 Of the top Vancouver beaches, Kitsilano Beach—known as "Kits Beach" to locals—is the most happening. On hot summer days, the beach is packed with sunbathers and swimmers by the water, volleyball players on the sand, tennis players in the courts, and Frisbee players on the grassy lawn. And with a cluster of bars and restaurants just across the street, the beach party can continue into the night. Kits Beach is also the best beach for swimmers: the waters are usually calm and the awesome Kits Pool, Canada's longest pool, is part of the beach's extended park. During the summer months you can also find free outdoor yoga near the pool. Run by the Mat Collective, the community classes are the ideal way to appreciate the sunset and embrace Kits Beach's healthy living vibe. Kits Beach was originally known as Greer's Beach, named for Sam Greer, one of the first non-native settlers in the area. In 1882, Greer built his homestead on the site where the Watermark restaurant now sits, and challenged the Canadian Pacific Railway (CPR) for rights to the land. Unfortunately for Greer, the CPR won that battle and took the land in the 1890s. Kitsilano Beach, as it is today, owes its existence to private citizens, who raised the money to purchase the land from the CPR, and to the Vancouver Park Board, who leased additional lots to create the extended park. Kits Pool originally opened in 1931 but in May 2018 the pool reopened with an extensive new $3.3 million facelift, following a winter of renovation. The pool is divided into three sections: a shallow section for families and small children, a middle section of roped-off lanes for lap swimmers and exercises, and a deep end for more casual adult and teen bathers. Kits Pool is open from mid-May - mid-September. Times vary by month, so check the Vancouver Park Board Kitsilano Pool schedule for hours of operation. Mid-week is often a little quieter than weekends. You can combine your trip to Kitsilano Beach with a trip to W 4th Avenue, Kitsilano's shopping and dining district; 4th Avenue is about a 15-minute walk north of the beach. Or, you can grab an after-beach meal at The Boathouse, a seafood restaurant right on Kits Beach, with incredible sunset views. Nearby is The Local, which is the best place to get a spot on the patio in the summer, and close by is Nook, a Vancouver chain of top notch Italian restaurants. Held every August, this festival celebrates outdoor sports and activities with a weekend of sporting on the beach, from volleyball contests to basketball, beach bootcamps, spin by the sea, sandy yoga, and stand-up paddling. A highlight of the 2019 festival is the quirky Bathtub Races, which return to Kitsilano after a 22-year absence and will feature wannabe winners and their converted bath tubs in a one mile race to the finish! Around the corner from the main beach is Hadden Beach aka Kits Dog Beach. With sweeping views of downtown, the North Shore, and the Gulf Islands, it's a picturesque spot to take your pooch for some off-leash fun and games. If you're driving, the major parking lots for Kits Beach are located off Cornwall Avenue, between Yew St. and Arbutus; this area also functions as a "main entrance" to the beach. The beach's pay parking lots are about $3.50 per hour or $13 all day (April 1 to September 30). To take a bus, use Translink to plan a trip. Or, if you're in Downtown Vancouver, you can take a False Creek Ferry to Vanier Park/Vancouver Maritime Museum, walking distance to Kits Beach. Kits Beach is the northernmost beach in the chain that curls around Vancouver’s western coast. South of Kits—traveling along the coast toward the University of British Columbia (UBC)—are Jericho Beach, Locarno Beach, Spanish Banks Beach, and Wreck Beach. What Are the Best Spots for Camping In and Around Vancouver, BC?